In last week’s blog post we talked about the important role leading with intention plays in boosting confidence and overcoming leadership fears. Intentionality is perhaps best seen in leaders who show resilience when facing setbacks. People need to see a strong, determined leader, particularly during tough times. This will encourage the people in your team, and in turn you will feel encouraged and empowered, and less likely to focus on self-doubts. As with many aspects of leadership, the direct approach to confronting fear is typically most effective. With the help of an executive coach, you can craft a plan to deal with your fears head-on. Peter Bregmen in Leading with Emotional Courage: How to Have Hard Conversations, Create Accountability, and Inspire Action on Your Most Important Work, encourages leaders to use fear as an incentive. By exposing your thoughts and perceived weaknesses to your coach, mentor, or trusted colleague, the secret’s power is broken. Talking through your fears is therapeutic, and you may see how powerless they really are. Freedom eludes you when you bottle up your fears. Solutions are usually less complicated than you first perceive. 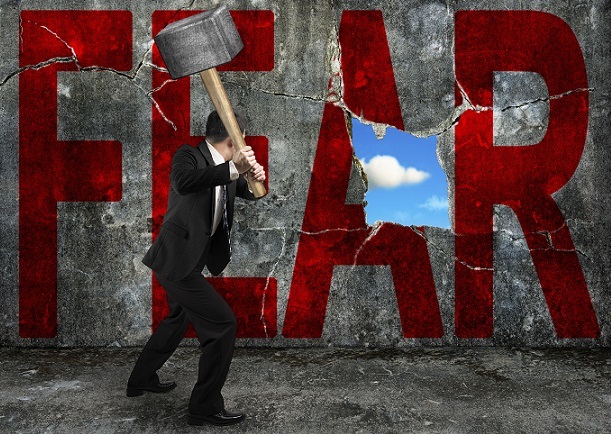 If appropriate, admit past fears to your staff – a move that can further reduce their impact. By being transparent and accountable, you’ll earn people’s admiration and avoid criticism or rejection. Strong leaders needn’t fear showing vulnerability if they deal with their fears directly and effectively. With experience, they realize their fears are generally overblown and far less powerful than originally thought. There’s no reason to allow fear to debilitate you. Organizations run more effectively – and employees have greater regard for their jobs – when leaders have the courage to lead boldly. The horses and I are here to help you face your fears head-on with our leadership coaching sessions. Contact me today to start the journey to greater confidence and fearless leadership!